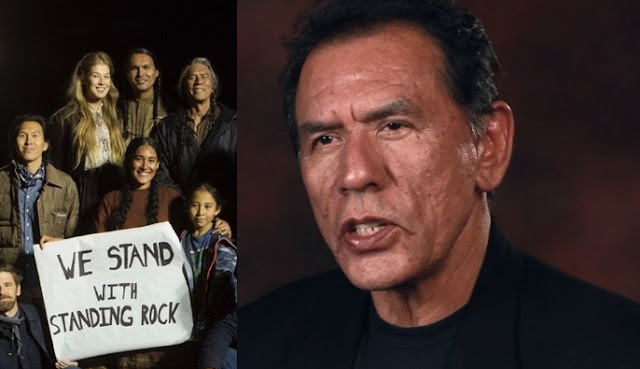 Written by Wes Studi : Wesley "Wes" Studi (born December 17, 1947) is a Cherokee actor and film producer from Nofire Hollow in Oklahoma. 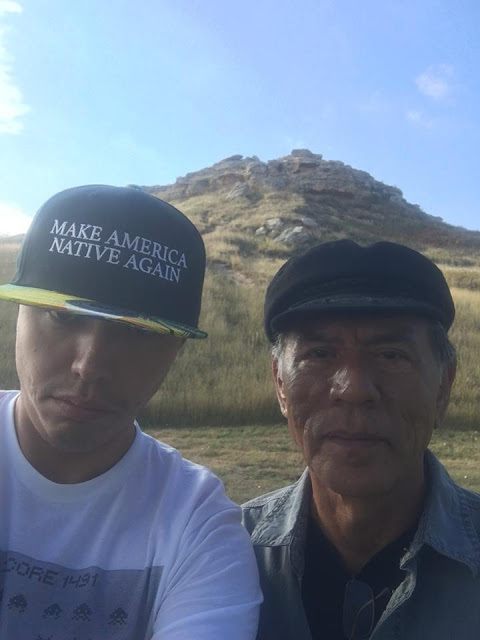 On Oct. 2, 2016, my son Kholan and I loaded up an SUV and hit the road for Standing Rock to show our support and dedication to protecting the lands and livelihood for all indigenous peoples. We’ll be here as long as possible to show our support for the movement. I’ll be keeping everyone updated on my Facebook and Twitter accounts. Water is life and we plan to do whatever we can to show our support to those defending the water, land, and sovereignty of the indigenous peoples of the world. Oil pipe lines have a notorious record, with oil companies covering up the numerous spills that have occurred over the years. Despite the inherent dangers, they continue to build pipe lines, threating the lives and livelihood of those near the pipeline and down stream. Severely increasing the danger of a pipeline spill in Standing Rock is the fact the pipeline would be built under the Missouri River, a water supply for millions of people. Studi warns indigenous people living closer to the environment will be the first to be affected by water contaminated by energy extraction, but those living further removed, in cities, will not escape the effects if companies continue poisoning our world at the same rate. The Studi men are calling on the oil industry and world to make better energy choices. I believe this demonstration could be the beginning of a worldwide movement to begin the end of fossil fuel use, and the start of a more focused search finding a different source of power and energy. It’s time we as people begin to phase out fossil fuels in favor of energy production less detrimental to our environment. Oil companies could use their wealth to research more and different alternative energy for our use. There is only so much oil to be found in our earth, and its extraction through fracking has been the cause of increased earthquake activity throughout the US, if not the whole world. We can only hope corporate and government powers can work together toward these ends. But we must first put a stop to the practice of uncontrolled greed and accumulation of goods, material, resources and money. Responses to " Cherokee Actor Wes Studi Stands with Standing Rock"
Be strong and be safe. You are heroes to all of us who know that water is life and that we are all interconnected in the web of life. We are profoundly grateful for Native leadership at this critical time in the history of human life on earth. Aho. Water is life.and life is precious.you take a stand for what you know is right. This story should be in every news outlet. What Energy Transfer Partners, the Morton County sheriff's department, and the governor of North Dakota are doing is criminal. The fossil fuel and pipeline companies are running roughshod over both people and the environment. 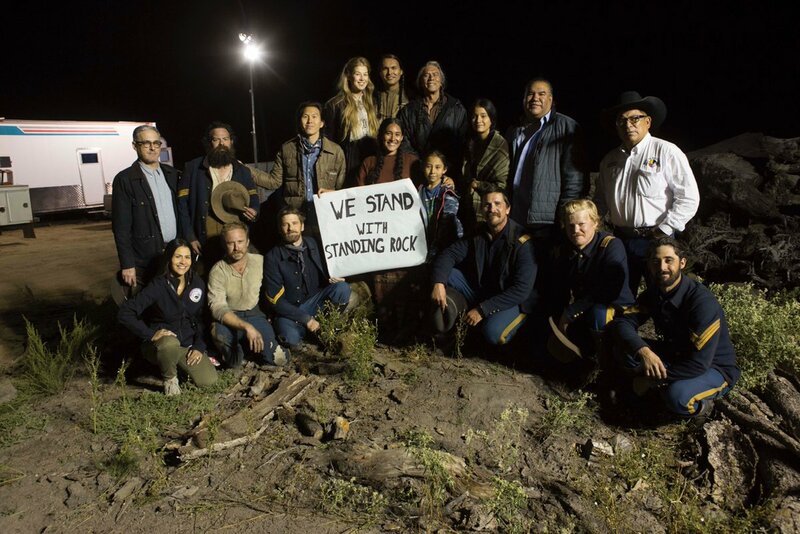 This has to stop, and will, when protectors band together. Good luck. Let's keep in mind this is about more than a pipeline it's about a paradigm that values money over life.